Two months ago a video went viral comparing the current iPhone 4S front panel to a 4.07-inch panel, which allegedly belonged to a new sixth-generation iPhone. Now, ETrade has posted a more in-depth video comparison of the iPhone 4S and the dubbed “iPhone 5” front panels. This longer display has been talked about for a while now but ETrade gives exact measurements on the difference. They reported that the 4.065-inch panel is 0.1mm thinner, has a 0.3mm smaller home button, and the area surrounding the home button area decreases in size, from 18.00mm to 15.40mm. 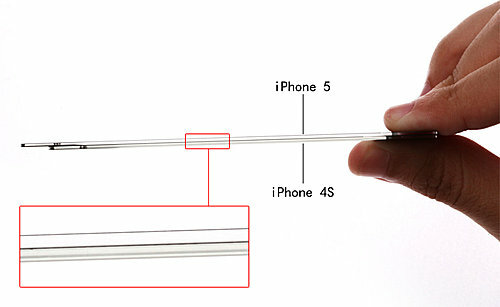 The area surrounding the earpiece on the top of the iPhone also shrunk in size. This size minimizing can allow for Apple to minimize the overall size of the iPhone while increasing the display size. ETrade also reported improved light transmittance for the next-gen panel and improved scratch resistance. So, the biggest change is that the iPhone 5 display is now close to 16:9 vs. the 3:2 aspect ratio for the current iPhone.